Change is the only constant in life. Change means growth. Change can demand you to be patient or it can hit you suddenly. Change is something we fear, and something I have always had difficulty with. It is something I have always craved for yet was afraid to take upon. A desire for change pushed me to reach outside my comfort zone and move many miles away alone for grad school. Big life changes have also come with lots of turmoil but have provided an understanding of the inner-workings of life - like the passing of my grandparents. It is indeed important to realize life is full of changes. That is how life unfolds and so, change is an integral part of life. Through change opportunities are created, friends are made, relationships end, careers moves forward. Thus it is through Change that one develops as a human being. Thus it is important to realize the type of change and the dose of change which is healthy for you. In doing so you will be able to recognize what type of change is not for you. Sometimes there is a certain change in your life that might set you back. This is manifested in various ways - maybe you are not ready to move across the world, maybe you are not ready to be in the relationship, or maybe this might not be the right time to make a career change. In today's world we are quite obsessed with doing everything at once or taking upon too much. Often times this is influenced by the false reality presented by social media. It presents a false image of all these big changes happening in others lives that seem to be lacking in ours. So we seek constant change and the idea of busy. Tweet: Our dilemma is that we hate change & love it at the same time;what we really want is 4 things 2 remain the same but get better -Sydney J. H.
Change can be good, but change can be bad, so it is up to you to figure out in which type of changing situation you strive in and which one stunts you. All my life I wanted to go away for school, experiencing living away, new place, new people, and new experiences. But as I grew older, with my anxiety really taking a toll on my health, the fear of moving away became bigger and bigger. So after my 2nd undergrad degree I decided to apply for grad schools and so I applied all over the country, the continent and across the pond in England. I got into every school I applied to - except for one - the one that was here, in my hometown. I received a scholarship to one in my home country but on the other end and was accepted to another program just a few hours away in the states. To add to this I got into one of the best/competitive schools to get into in my field - and it was in England. I had taken a year off after undergrad and did not apply to grad school because I wasn't ready to move away. But here I was a year after faced with really hard decisions. I took my time to think and I decided it was time to get out of my comfort zone. It was time to take the leap of faith. I gathered all my courage and thought it was time - time for change - how could I let such a wonderful opportunity go? So I moved across the pond...to England. I enjoyed my Masters program and made some great friends. But it was one of the hardest years of my life. My anxiety and depression hit me harder, I ended up in the ER twice ( I have a legit fear of hospitals). I was so sick at one point that my mom had to fly in to be with me. My professors had me wanting to put my dissertation on hold for a year. But I somehow pushed through, upon reflection I honestly feel it was because of the unconditional support of my family. I came back home early and finished my dissertation on time from home. And finished with good marks. Am I glad I went? Yes. Am I glad I got to experience going away for school and meeting wonderful people? Yes. But in hindsight, I wasn't ready. And that resulted in my depression hitting me mid way through the year, which coupled with my anxiety and being so far from my emotional support system, resulted in me being in the ER in a foreign country. Till this point in my life I had not really dealt with or tackled my anxiety + depression. I had just pushed through (the only way I knew how to cope) and naively thought I would be able to do the same this time. But I wasn't able to and the consequences were not so great. Thus, taking upon this change of going to Grad School and moving so far away was probably not done in the right time in my life. Meaning, it was not the right dose of change that I could handle at that point in my life. In fact, it stunted me in some ways. I have been traumatized about living alone and so far from home ever again. The good outcome was I learned a lot about myself and have decided to focus on dealing with my anxiety and depression. Health has been a constant struggle for me since I was an infant. I have had to deal with many health complications and visits to the doctor and specialist offices, making it a routine for me. But as I mentioned in this post, being proactive about my health has always taken a back seat for me. I was too focused on my academics and moving forward to become "successful" in life that I didn't realize that without good health none of that is possible. My biggest wake up call was going away for Grad School and realizing I couldn't ignore my health anymore. Before leaving for Grad School, when I was starting to realize that I needed to pay some attention to my health in a proactive manner, I had seen a naturopath and had been on supplements and a strict no gluten/wheat diet. But it was honestly once I got back from Grad School I decided that this was it, I need to make a CHANGE. A change in my lifestyle and needed to live a more healthier lifestyle. Whether that was sleeping at regular time, going for walks, going to yoga consistently, eating in a healthier manner or just taking time for myself. This change was needed in my life in order for me to live a positive life. I also decided to tackle my mental health issues as well. This was a scary change for me, but it was something I had to tackle head on. Through these two examples, that are in actuality linked, I wanted to demonstrate, firstly, that change can be good. Secondly, that change can be bad if you do not realize that the timing of the change or the dose of the change might not be right for you right at that given time. 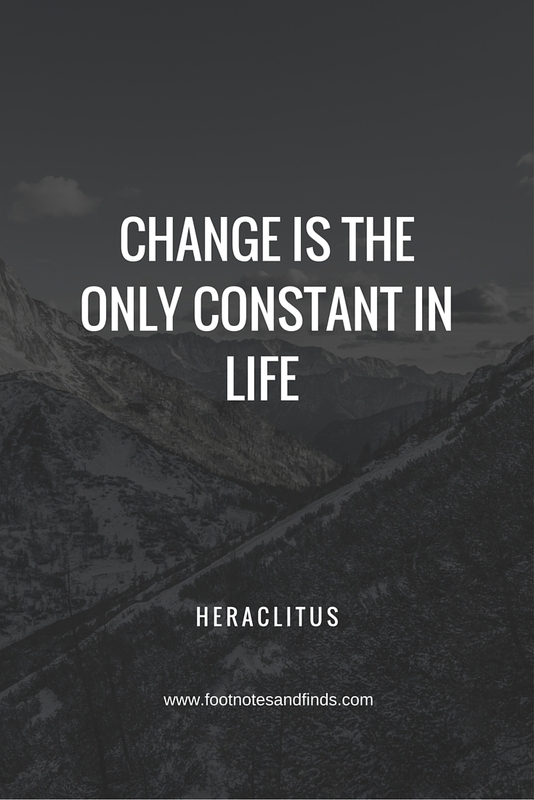 Lastly, that a single change, so in my case going away for Grad school, can produce many other changes that can be both positive and negative, making change a constant part of our life. Get out of your comfort zone? YES! Take that leap of faith? YES .....BUT at the same time assess before doing all that. Really assess. I'm sure we all want to drop everything and go on a crazy adventurous year long trip like the ones that our social media is flooded with, but really assess if this change is something you really need right now. If so, then you just need to GO! But if it realistically wouldn't be the right thing right now in your life as in you might not be mentally or physically ready for it then it can in turn have many adverse effects on your life moving forward. For example, a trip taken at the wrong time for you may become a negative experience because you're not in the right frame of mind or you're not physically fit enough to participate and may end up ruining the idea of travelling for you in general or travelling to that particular area etc. At the same time we must remember that if change is a constant then we can retain the hope that if something is not for you right now in life, like that amazing trip, then it may be in the future. We must learn to view ourselves and our lives in a more flexible manner and not be so rigid. This means, that although identifying what changes may be bad for us in the present is a good thing we must not deter ourselves from thinking that that means that particular change is now and forever impossible for you, because that is simply not true. Another important thing to remember is that even bad experiences from changes you were not ready for have some positives to them, you just have to learn to see them and this way the bad changes wont have an entirely negative impact on you. So, do I regret any of my experiences brought through by change no - because to me that is part of my life's journey and you grow as a person and I can look back and learn. Love this post dear! Great inspiration! Greatly written! Loved this post, and the quote is SO accurate! This is so great! It's so important to embrace change and roll with the punches because before you can get over one change another one is headed your way. I find that travelling and experiencing other cultures actually quickly helps with this. I owe my adaptability to experiencing so many different countries and cities! Very inspiring your post! I like it so much!